The A710 road runs from Dumfries to Dalbeattie following, for the most part, the coast of the Solway Firth. 6 miles due south of Dumfries is the village of New Abbey, perhaps Dumfries and Galloway's prettiest village. The road winds through this interesting village which is dominated by the ruins of 13th century Sweetheart Abbey. It boasts one museum: The New Abbey Corn Mill, which dates from the late 18th century. In the picturesque Square, in reality more of a triangle than a square, is the General Shop, and the Abbey Arms, late 19th century. Rising from the very edge of the village and lording it over all is Criffell, at 569 metres (1867 feet) the highest point for many miles around. There are two churches; the Presbyterian Church and St. Mary's RC Church. Close by St. Mary's are the local Primary School and the Doctor's Surgery. 5 miles further along the coast is the pretty parish and hamlet of Kirkbean. Here is the John Paul Jones Museum, birthplace of "the Father of the American Navy". Close by are the coastal villages of Carsethorne and Southerness with their respective hostelries, The Steamboat Inn, and the Paul Jones Hotel. For those who play golf there are many courses throughout the area, but the gem of them all is the stunning championship links of Southerness Golf Course. Further west and north lie the attractive towns and villages, open countryside and forests of Dumfries and Galloway. 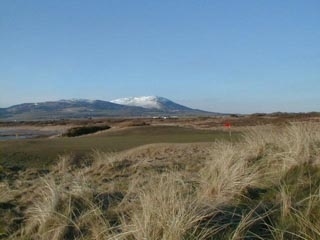 Golf, sailing, walking - Galloway is Scotland's best kept secret! Onto Colvend, here you will find a delightful popular beach, Golf Club, village shop and Restaurant. The small village of Rockcliffe is a child's haven for exploring the rock pools and beach with a delightful coastal walk through to Kippford. The village of Kippford is renowned for sailing boats, with the Anchour Inn providing excellent food, people travelling miles to enjoy.